Chris Baskind is the Director of Web Operations for Vida Verde Media, the green lifestyle publishing group responsible for Lighter Footstep and EcoTech Daily. Chris’ background in broadcasting, writing, and marketing serves as the basis for his new online venture. Lighter Footstep is a web-based resource for Green Living: adopting resource-smart attitudes and techniques to flourish in the new century. EcoTech Daily is a popular new website focused on Green technology, gadgets, and news. Before co-founding Vida Verde Media, Chris spent seven years as the Director of Programming for a major broadcast company’s cluster of radio stations in Mobile, Alabama. His broadcast career has taken him to assignments in Tallahassee, Memphis, and New Orleans. 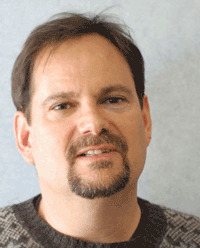 Chris is a freelance writer and longtime blogger. His experience running the now-retired PaperFrog weblog led him to an interest in web development, and he is responsible for the design and day-to-day administration of Vida Verde Media’s sites. A lifelong cyclist and occasional scuba diver, Chris’ love of the outdoors and the environment are reflected in Vida Verde Media’s drive to secure a clean, equitable, and sustainable world for future generations. Chris lives in Pensacola, Florida, with his trusty Golden Retriever, Ubu; Max the Rottweiller; and Stella the Cat.